disclaimer: this article heavy on the stats. If youre a stat-o-phobe, turn back now. You have been warned. The Ravens currently sit at 4-3, tied with the Cleveland Browns (!?!) for second place in the AFC North, just a game behind the Squealers. Historically, the Ravens are a much better team in the 2nd half of the season under head coach Brian Billick. They have won 5 straight (regular season) games when coming off the bye week, and are 6-3 overall. In regular season games after Nov. 1, the Ravens are 46-23 under compu-coach. Last season, the team went into the bye at 4-2, and dominated the second half of their schedule to finish 13-3. The Ravens are 2nd in overall defense, trailing only the Squealers, and 2nd in rush defense, looking up at the Tennessee Titans. 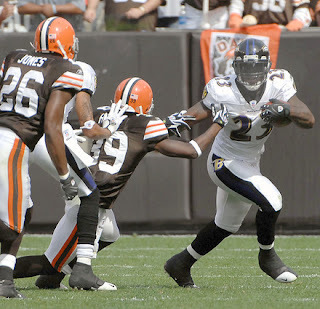 Running back Willis McGahee is 2nd in the NFL in rushing yards, and is averaging 4.4 yards per carry. Backup QB Kyle Boller has played well in relief of the injured Steve McNair, and is finally showing some signs of progress that we have been waiting years to see. Wide receiver Derrick Mason has been a huge part of the offense, and leads the NFL with 56 receptions. Return man Yamon Figurs ranks 3rd in the NFL in kick return average and 4th in punt return average among players with at least 5 attempts. Kicker Matt Stover has been his usual consistent self, leading the league with 18 field goals on 21 attempts. Despite their success on the ground, the Ravens have been unable to put together a constant mid-range passing attack to compliment their running game, and are just 16th in the league in total offense. They have struggled mightily in the dead zone, and as a result are 25th in the league in points per game, averaging just 17.7. Going into week 8, only 3 teams were having less success scoring touchdowns inside the 20, and those teams had a combined record of 3-17. Overall, Ravens quarterbacks have turned the ball over 9 times while throwing for only 5 touchdowns. Defensively, the Ravens have again been vulnerable to the big play, and have not shown the ability to shut teams down when leading in the second half. They have allowed 25 plays over 20 yards, and 6 over 40. They also have not pressured the quarterback as well as they did in 2006, and have only 15 sacks through 7 games, 16th in the NFL (last year, the team had 60 sacks, just one behind the league-leading Chargers.) No Raven is in the top 50 in the league in sacks, with Corey Ivy, Jarrett Johnson, Kelly Gregg, and Terrell Suggs sharing the team lead with 2.0 each. Plenty of ugly to go around this season so far. After making it through the 2006 season incredibly healthy as a team, the injuries have caught up to the purple and black this year in a big way. Jonathan Ogden has not started a game since opening night, and just took his first snaps since then last week in Buffalo. Quarterback Steve McNair has made only 4 starts, and came out early in one of them. Even when playing, McNair has been bothered by a groin injury, which has made his throws inaccurate, wobbly, and all around, well…ugly. Tight end Todd Heap, left tackle Adam Terry, and center Mike Flynn have all missed games due to pain. Wide receiver Mark Clayton was slowed by injury early in the season, but seems to be getting over it. On the other side, the D hasn’t escaped the bug either, as end Trevor Pryce has been out since week 2 with a broken wrist, and corner Chris McAlister may or may not return this week after injuring his knee in week 6. Samari Rolle also missed significant time due to “undisclosed illness.” The health of this aging core group of players will play a big role in how the rest of the season plays out here in B-More. The teams the Ravens have beaten (Jets, Cardinals, 49ers, Rams) have a combined record of 6-24, while the teams they have lost to (Bengals, Browns, Bills) are 9-12. Looking ahead to the rest of the schedule, the remaining teams on the Ravens docket are a combined 34-24. Also, the quarterbacks the Ravens have beaten this season on their way to a #2 ranked defense have included names like Kellen Clemens, Kurt Warner, Trent Dilfer, and Gus Frerotte. A little shudder shakes the Nest when we think of how this team will fare against the Peyton Mannings, Tom Bradys, Ben Toothlessburgers, and Matt Hasselbecks of the world, at least if they continue to play the way they have, which is to say extremely loose in the secondary. Another big double-branch on the ugly tree that has been the 2007 season is the play-calling of coach Billick, and now the outspokenness of Ray Lewis as pertains to it. Billick has been criticized heavily, here and elsewhere, for his refusal to run the ball in certain situations, particularly at the goal line in Cincinnati and at midfield in the final minute in Buffalo. We don’t know if he outsmarts himself, thinking “well, they expect us to run here, so let’s fool them and go with the pass,” or if he really does have more confidence in his passing game than running game to pick up 2 or 3 yards. Both scenarios are cause for great concern by fans hoping to see some wins pile up in the 2nd half. Equally disconcerting is the fact that Ray-Ray saw fit to call the coach out on his radio show. The last thing we need is to see the locker room divide as it did three years ago, which led to several sub-par purple and black seasons. Lewis should have kept his complaints private, in-house, and spoken to Billick one-on-one like a man. As upset as Ravens fans are about the play-calling, the court of public opinion has spoken, and their resounding response to Lewis is to just “SHUT UP!” As a matter of fact, it could be argued that many members of the team should shut their mouths a bit, as it seems just about every player has their own weekly radio show that they are hosting. Time that could be better spent preparing for the next opponent. The fact of the matter is, at 4-3, the Ravens control their own destiny at this point. They have 4 division and 8 conference games remaining to put themselves in a position to make the playoffs. As good, bad, or ugly as anything has been so far, there is still a lot of football to be played, and plenty of time to either right the ship, or sail it right off the end of the earth. special thanks to the Nick-a-What research team on this article. Birds Nest Prologue: Professional athletes should never really need “Gut Checks,” or “Wake-up Calls.” They are men being paid to play a boy’s game, in front of adoring fans who give up their hard earned money to watch them, their tax dollars to finance the teams’ stadium, and who live and die with each game. The least they could do is try as hard as they can, all of the time. Of course, in the era of the spoiled athlete, most do not. That being said, several Ravens and pundits are labeling the loss in Cleveland a wake up call or a gut check. So then what were the 2 near-collapses against the Jets and Cardinals at home? One would hope that those would have “woken” this team up. As fans of the team, we can only hope that they have not been giving their best efforts, and that is the reason for the mediocre play so far this season. The only other option is that they are not a very good team. Some talking heads around the country that don’t see this team play on a week-to-week basis have started labeling them as such. We at the Nest know better. There is simply too much collective talent on both sides of the football for this to be a problem of having a “bad” team. As long ago as it may now seem, it was just last year that the Ravens were 13-3 and the #2 seed in the AFC. However, a quick look around the NFL is evidence that much can change in a year. The Chicago Bears are 1-3, but they have been decimated by injuries on defense and hurt by the regression of Rex Grossman and loss of Thomas Jones. The San Diego Chargers are 1-3, but they are under new head coach Norv Turner, and to say that everybody saw this coming from them would be an understatement. The New Orleans Saints? Well, they just ran out of Fairy Dust. The Ravens, while having sustained a few injuries, are still pretty much the same team, with the same coaching staff, and game philosophies as they had last year. While this may seem at first to be a positive, perhaps it is time to start thinking about how to change things up a bit. The Ravens offense has been much more unpredictable this season when compared to years past, in terms of whether they will run or pass on any given down, which, along with the upgrade at running back, has led to them currently standing at 8th in the league in total offensive yards. But it hardly matters whether you are running for 3 yards on 1st down and throwing for 5 on 2nd OR throwing for 5 on 1st and running for 3 on 2nd. Its still 3rd and 2. This offense is still predicated on SHORT passes and controlling the clock. Which works fine when you have a defense that is consistently ranking in the top 5 in the league, as it has been since Brian Billick and his West Coast Offense have been in B-More. But when your vaunted defense is giving up over 22 points per game, scoring 20 on a handful of long drives isn’t going to cut it. You’re going to need to put up some points. Which means a quick-strike touchdown here and there, exactly what has been missing for the past 8+ seasons. The Ravens have as much talent on offense, at wide receiver and tight end, as most any team in the league. The difference is in the way they are utilized in the offensive schemes, which results in the discrepancy of being ranked 8th in the league in total yards, yet 18th in points per game. For comparisons sake, the top 4 teams in the league in total offense, 1 through 4, are: Dallas, New England, Indianapolis, Detroit. Top 4 in points per game? Again: Dallas, New England, Indianapolis, Detroit. The yards just aren’t translating into points for the Ravens, because they are coming between the 20s. The lack of quick-strike big plays, combined with the abysmal red zone efficiency, lead to a lot of yards….and a lot of field goals. So instead of (or in addition to) a gut-check to the players, this could serve as a “brain-check” to the Ravens coaches. Last season, Brian Billick made a job and season-saving decision by firing his good friend Jim Fassel as Offensive Coordinator when the Ravens were sitting at 4-2 atop the AFC Central. Perhaps this season he can make a similarly drastic move, by allowing his quarterbacks to throw down the field. We don’t know if it really matters whether it is Kyle Boller or Steve McNair. Some would argue that McNair does not have the arm strength to throw the ball all over the field, but both quarterbacks are averaging ~6 yards per attempt this season. Even when he has been in, Boller has shown no signs that he is being encouraged to stretch the field. The change needs to come from the game plan, not from the guy throwing the ball. Teams have 17 games of film from last season to look at just how the Ravens got their 13-4 record. The same formula may not prove as successful this time around. So will the Ravens coaches stand still, continue to put all the pressure on the defense, and hope it returns to its former self? Or will they take steps toward improving the point output of their offense, serving to take some pressure off of said defense, at least while they get their feet under them and recover from the barrage of punches they have taken over the first 4 games? The suggestion is not so much for a complete offensive overhaul as it is just a plea for the realization that the team may NEED to score some points to win ballgames. A sense of urgency from the O, evidenced by some shots down the field, some big plays, and a bit of creativity in the red zone. Lets show off the offensive weapons we have here in B-More. The defensive ones just don’t seem to be getting it done like they used to. The Ravens are not a bad team. They are a good team playing poorly. Time to get this ship headed in the right direction. Welcome to the B-More Birds Nest blog. A blog dedicated to the MLB and NFL franchises of Charm City, Maryland – The Baltimore Orioles and Baltimore Ravens. Here you will find news and comment on these teams, including game analysis, rumors, and more. There will also be posts dedicated strictly to belittling any rivals (or sworn enemies, as we like to call them) of Baltimore teams, including, but not limited to: the New York Yank-offs, Boston Red Sux, Pissburg Squealers, Sin-citynatti Bungles, and Cleveland Brown Stains. We hope you enjoy the blog, and please feel free to participate.